Double flowers with a pink center and white outer petals. These dazzling doubles will catch any gardener's attention! Excellent for naturalizing, abundant blossoms each year. Fine cutting flowers. Loosen soil about 10" and water well after planting. Flowers should be cut when petals begin to fade, so they won't go to seed. Seed formation drains off the food bulbs need to produce next year's growth. Leaves should be allowed to die back naturally before removing. A winter mulch, 2-4" deep, of straw, evergreen boughs, peat moss or shredded leaves can be applied after planting. Remove in the spring. 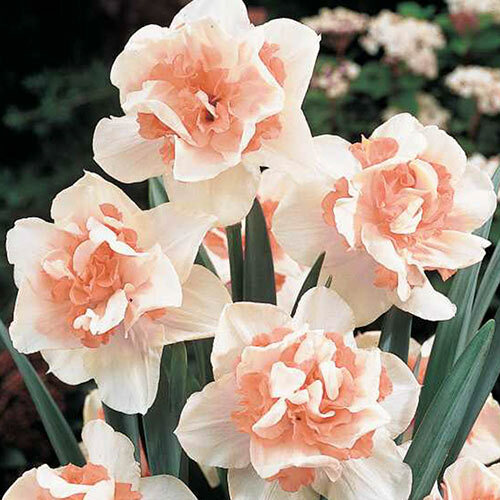 Daffodils need at least 1" of rain or equivalent watering each week during their growing and blooming season.